Being the first company in Turkey providing intermodal transport – an ever-developing sector in the world – services since 2014, Sarp Intermodal continues to diversify its investments and services in the field of intermodal transport. The Board Chairman Onur Talay has announced that they will start partial intermodal transports with 45′ containers. The preparations are now over and the service will be launched in November. The intermodal transport mode usage has significantly increased in recent years in Turkey – although the usage ratio is not as high as the usage in Europe. Being one the first companies focusing on this field, Sarp Intermodal continuously extend its service network and increase its equipment diversity. First Priority is to Improve Intermodal Transport in Turkey! International Partnerships Provide a Major Source of Power! Stating that they establish long term business partnerships with the companies dominating the intermodal transport market in Europe, Talay underlined that they have an ongoing business partnership with Gartner KG for 4 years and told that they have started to cooperate with Rat Logistics for dry-bulk goods last year. Investments Mark the 4th Year! Having organized the highest number of 45′ container transportations in Turkey last year, Sarp Intermodal has started this year with new container investments. Having made an investment for buying 100 45′ containers, the company has also invested in 50 ISO Tanks for the field of liquid transport where the company records sustainable growth in the last two years. After these investments, Sarp Intermodal currently have more than 500 45′ containers, 50 ISO Tanks, 60 Chassis and 30 trailers in its own fleet. The company has also purchased 10 chassis in 2017. Nothing that the chassis and trailer investments will be used in transports from ports and terminals, Talay emphasized that they organize all operations for intermodal transport with their own vehicles. Telling that they prefer chassis specially designed for 45′ containers, Talay has stated that the lightweight structure of those chassis make the intermodal container transports more advantageous. Faster Growth with Different Equipment! Nothing that they mainly provide services to food, automotive, textile and chemistry sectors, Talay told that they carry out 80 percent of the transports with 45′ containers and the remaining 20 percent with ISO Tanks. Emphasizing that they place importance to have different types of equipment in their fleet, Talay remarked that they believe that this will contribute to the fast development of both Sarp Intermodal and intermodal transport. International Presence to Be Increased! Stating that after opening their first international office in Italy, they have also made investments in Bulgaria, Talay told that they will perform operations in Bulgaria under ‘Sarp Intermodal Bulgaria’ name. 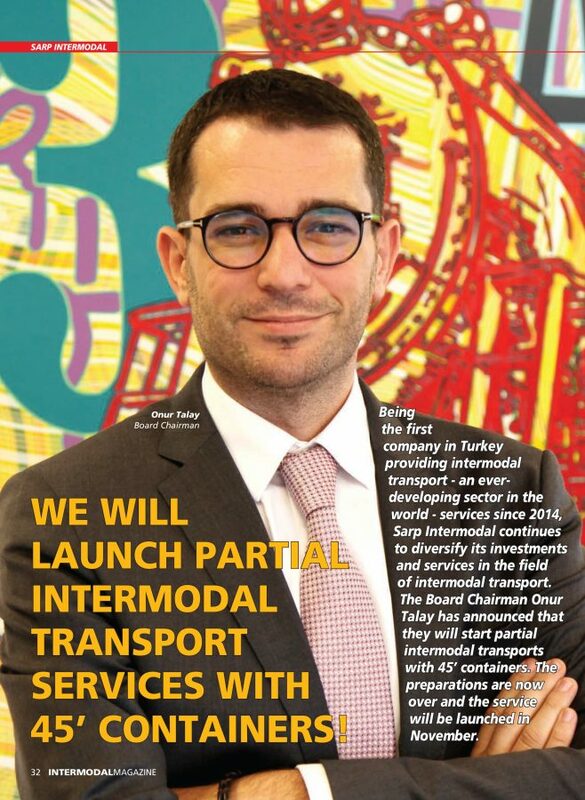 Giving information of the new company they have established, Sarp Intermodal Board Chairman Onur Talay further made the following remarks: “Since Bulgaria is a EU member state and allows free movement in Europe, we have made investments in Bulgaria. Its location’s being close to Turkey is another preference of choice.” Saying that the initial phase of this investment covers the purchase of 10 trailers for use between Bulgaria and other European countries, Talay has announced that their investments will continue for the next two years. Investments Planned for Germany and UK! Nothing that they aim to make investments in Germany and UK as well, after Bulgaria, Talay underlined that these offices aim for managing the transport organizations in these countries. Mentioning also that their transports are mostly destined to the European countries, Onur Talay told that they select the countries they serve based on the lines of the railway and Ro-Ro operators and emphasized that the line or operator numbers should increase. Reminding that they have started to organize transports to Tunisia in North Africa, they closely monitor the developments on Kars – Tbilisi – Baku train line to be launched in future months.